repellent, gardening and automotive goods to consumers. 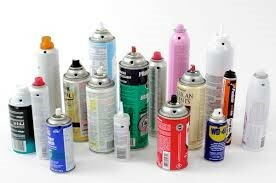 Aerosol cans are pressurized containers and classified as Dangerous Goods under Class 2, with a listed international reference number of UN1950. All aerosol cans present a significant hazard in workplaces and in society because of the compressed gas used as a propellant. When exposed to fire, aerosol cans will either violently rupture or produce burning jets of flame. It is very important to store aerosol cans safely. YAKOS65 Aerosol Storage Cages range from 100 up to 420 aerosol cans (66mm diameter, 245mm height) depending on cage model. They are constructed from heavy duty, powder-coated steel, robust and easy to operate. YAKOS65 Aerosol Storage Cages feature high open area perforations which deliver natural ventilation, and all appropriate warning and safety signs is included. Bolt down plates allow the cage to be permanently fixed for added security and all doors can be locked using the padlock lug (padlocks are not supplied). Safely store up to 420 aerosol spray cans in this heavy duty, powder-coated steel aerosol storage cage. Heavy-duty, green powder-coated steel construction. Suitable for storage of up to 336 aerosol cans (66mm diameter, 245mm height). Solid steel roof and floor with mesh wall panels to provide wide open area perforations deliver natural ventilation. Robust, lightweight and easy to operate. Door can be locked using the padlock lug (padlock not supplied). Bolt down plates enable the cage to be permanently fixed to the ground for added security. Includes appropriate warning and safety signs.